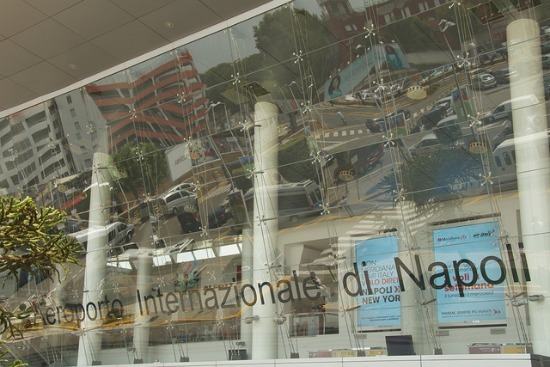 The international airport at Naples, Italy is a convenient and easy way to reach Naples, Sorrento, the Amalfi Coast and other top travel destinations in Campania and southern Italy. 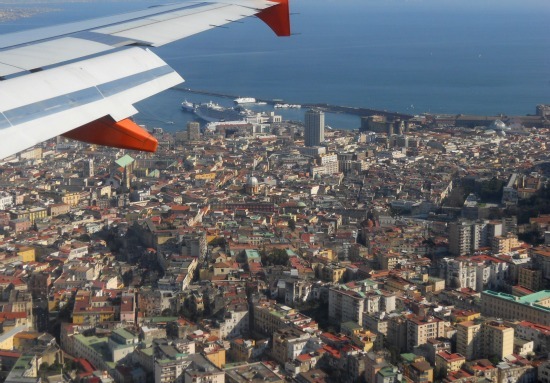 Travelers on flights to Naples have the first glimpse of this beautiful city on the Bay of Naples as the plane comes in for landing at the Capodichino International Airport. With a view of the towering peak and slopes of Mt. Vesuvius, the colorful buildings and that mesmerizing blue of the sea, it's hard not to be enchanted by Naples before you even arrive! 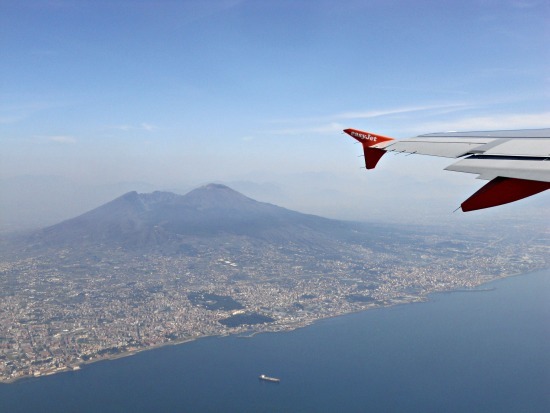 When arriving on a flight to Naples, try to book a window seat so you can enjoy the beautiful views. 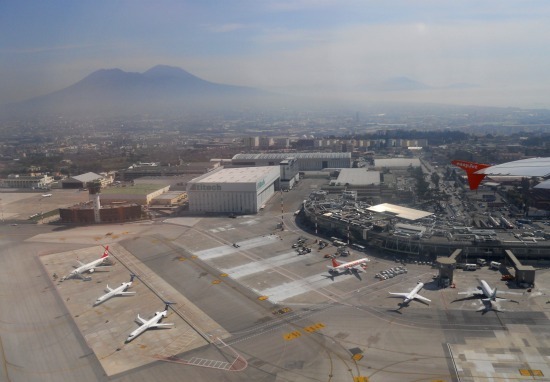 The Naples International Airport, often simply referred to as Capodichino after the district where it's located, is only 6 KM northwest of the city center. This means that many landing paths on flights to Naples pass very near the center of the city with great views of the centro storico with its distinctive glass domed roof of the Galleria Umberto I, the soaring roof of Santa Chiara and even large cruise boats docked in the Naples port. You might even spot Castel Sant'Elmo and the beautiful Certosa di San Martino high atop Naples in the Vomero district. Many airlines offer flights to Naples direct from cities across Italy and Europe, including direct flights to London, Paris, Munich, Berlin, Frankfurt, Brussels and many destinations in the UK. During peak travel season there are flights to Naples from many international directions including a direct flight from New York City to Naples, Italy. Whether you're traveling from Europe or connecting through a European airport, it's very convenient to arrive directly in Naples. Upon arriving at the Naples International Airport you can easily find a taxi to reach the city center or take the Alibus Airport Shuttle for €3.00, which departs from the airport about ever 30 minutes for the Naples Centrale train station or the Molo Beverello Port. From the Naples Centrale train station you can reach other areas of the city via taxi or public transport, take the Circumvesuviana train to reach Sorrento or from the port take a ferry to the islands of Capri or Ischia. Wherever your travels will take you in Campania, the Naples International Airport is the gateway to discover all the charms of southern Italy! 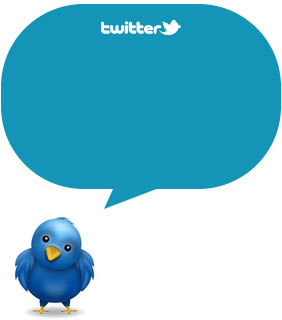 Subscribe to our RSS and we’ll keep you updated !